Welcome to Upstate Health, a magazine produced by Upstate Medical University to inspire healthy living. You will find stories about medical care and wellness, of course, but also a variety of articles that pertain to life in Central New York. Our experts share advice on caregiving, food and leisure activities. Our pages also showcase important work in our community and interesting news from the Upstate campus. You will meet researchers, students, healthcare providers and patients. We hope you will appreciate the artistry within our science – on our back page every issue. Got a story idea? Want a free subscription, or extra copies for your office? Contact us at whatsup@upstate.edu or by phone at 315-464-4836. 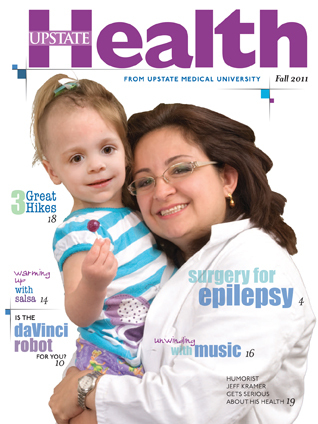 For appointments or referrals to the health care providers in this magazine, or for questions about health topics, contact a registered nurse at Upstate Connect at 315-464-8668 or 1-800-464-8668, day or night. Can employers make a difference in diabetes? Low fat or low carb for weight loss? This entry was posted in community, health care and tagged academic medical center, health care blog, health care social media, hospital blog, hospital social media, medical blog, SUNY, syracuse health care, syracuse hospital, university hospital, upstate medical, upstate university. Bookmark the permalink.